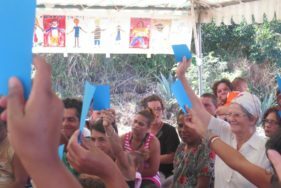 Cultural Gatherings: Street Libraries, People’s Universities, and commemorations of the World Day for Overcoming Poverty help people in poverty to access culture and knowledge and to be recognized as actors in society. 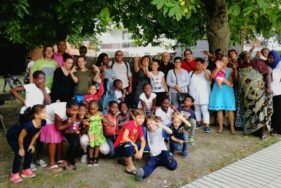 Youth Groups: Bringing together young people from around the island with the choreographer and singer Thierry Gauliris, the youth group produces theater pieces and has published a CD of poems and songs. Pilot Projects: The Fourth World Human Rights House opened in 2006 and serves as a space for welcoming families and sharing their lives and experiences. Access to human rights: Our team supports a group that accompanies underprivileged families as they gain access to their rights. 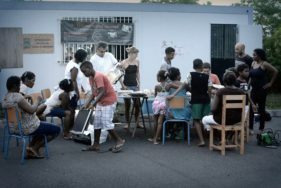 This group also supports the relocation of families living in the slums of Grande Fontaine. ATD Fourth World arrived in Reunion in 1979. In 1987, the Fourth World Human Rights House was built in Trois Bassins. In 1989, the first replica of the commemorative stone in honor of the victims of extreme poverty was inaugurated in St. Denis.